It promises to be an extremely busy and exciting Legislative Session in Salem in 2019. The OSPA Government Affairs Committee (GAC) is already making plans.. For now, please click here for a look at the OSPA Legislative Successes achieved on behalf of the PA profession! To Make a PAC Contribution for 2019 - Please Click Here. Issues and Legislation - Current alerts, bills, votes, more. OSPA is represented at the Oregon State Capitol by Thorn Run Partners, a Portland-based state government affairs firm. Elizabeth Remley has represented OSPA since 2011. She joined Thorn Run Partners' Oregon practice in 2012 and brings considerable experience working with Oregon's state and local governments. Ms. Remley's previous work includes representing a major hospital and delivery network, a mid-sized health plan, and numerous land use, technology, public infrastructure and transportation clients. On behalf of her clients, she contributed to the creation of Oregon's health insurance exchange and helped establish the framework adopted to guide the state's health care transformation. A graduate in Journalism and Economics from the University of Oregon, Ms. Remley previously worked for Oregon-based communications firm, Vox Public Relations Public Affairs. She currently volunteers as the director of communications for the nonprofit academic mentoring program Minds Matter of Portland, where she also served as a mentor for three years. Daniel Bates joined Thorn Run Partners in 2010 after serving the City of Portland as its Director of Government Relations. Previous to his tenure at the City of Portland, Mr. Bates was an attorney and lobbyist with the legislative practice group at Patton Boggs LLP, DC's largest lobby shop. During his career, Mr. Bates has represented large and small cities, counties, transit agencies, ports and state governments- helping his clients achieve both funding and policy goals. Navigating projects that require government relations expertise at local, state and federal levels simultaneously is a substantial component of Mr. Bates's professional portfolio. Mr. Bates received bachelors of arts degrees in Political Science and History at Houghton College in Houghton, New York and earned his juris doctor from the University of Virginia School of Law. When he’s not in Washington, DC, Mr. Bates lives in Portland, Oregon with his wife Allison and two children. Have you Registered for the 2014 OSPA FALL CME Registration? 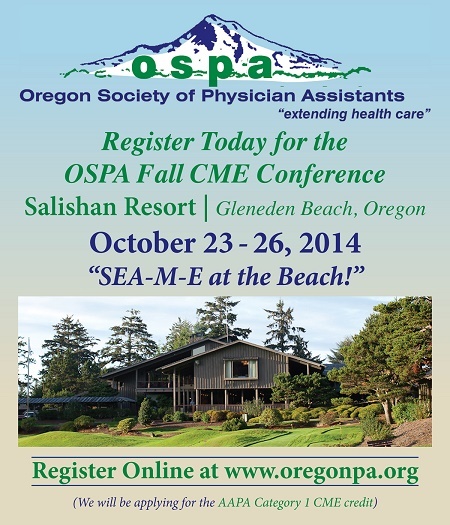 The 2014 OSPA Fall CME is Now Approved for a Total of 41 Hours of CME! Individual PAs can earn as many as 30 hours of CME at this meeting. This program has been reviewed and is approved for a maximum of 41 hours of AAPA Category 1 CME Credit by the Physician Assistant Review Panel. Physician Assistants should claim only those hours actually spent participating in the CME activity. This program was planned in accordance with AAPA's CME Standards for Live Programs and for Commercial Support of Live Programs. and you are paid up until the end of 2015! “The Biggest and Best of OSPA Fall CME Conferences Awaits You"
* Join the OSPA as a 2014 Member and Save $50.00 on your registration fee! * Ask your Practice Administrator or Supervising Physician to cover your costs (registration and lodging)! * Consider inviting a colleague to join you at the Fall CME and share the lodging costs and learning experience! * If you haven't attended a Fall CME in a few years you don't know what you've been missing! Forbes Magazine Identifies the PA profession as being the Top Best Masters Degree Program for Jobs - Click Here for the Ranking At the Fall CME, plan to hear Michael Rowe of the AAPA discuss, "Proving Your Worth to Your Practice or the Healthcare System!" took effect on July 1st. A monumental piece of legislation which benefits Oregon’s Physician Assistants and the patients we serve was signed into law by Governor John Kitzhaber. Known as SB 1548, this piece of legislation has been termed the PA/NP Technical Fix Bill. While the bill’s description was simple, the process of reaching the final outcome was complex and represented Grassroots Advocacy at its very best….something of pride for every PA in Oregon. You know, and most importantly your patients know, that Physician Assistants are a critical component in the delivery of effective healthcare in Oregon. We ensure that our patients receive the very best of medical care throughout the year. However it has been the experience of many PAs that even though nearly everyone knows that PAs are qualified to perform certain procedures and services that somewhere in time the term “PA” was excluded from legislation and regulations – and PAs were absent from serving patients alongside MDs, DOs, NPs, RNs, and other medical professionals. The OSPA Governmental Affairs Committee reviewed 180 Oregon Statutes and identified 90 feasible sections of the Statutes where PAs were excluded from providing medical care to patients, of which 75 ended up in the final legislation. By utilizing the relationships that have been developed with State Senator Laurie Monnes-Anderson, who agreed to champion the legislation, the committee decided that NOW was the time to correct the past and do a major legislative fix to laws on the books and provide PAs with the ability to practice medicine and not have to worry about obstacles that were unintentionally preventing them from providing patient care. Here a summary of what happened from beginning to successful enactment of the new legislation…. • More than 350 emails were exchanged among committee members debating and re-debating what needed to be done. • ZERO ….. “0” votes in opposition to this legislation were cast by Democrats or Republicans (AKA your patients) as the legislation worked its way through the legislative process. In summary, SB 1548 is getting signed into law. Now, instead of having to justify why you should be able to perform procedures and services that you were specially trained to do, you can point to the law – and share with your practicing physician – that the NEW law provides freedom for your practice and access to quality medical care for your patients. As you review the new legislation when it appears in the Oregon State Statutes you may identify other areas of State Law which requires changes. Please let us know if something jumps out at you that might be worthy of getting changed or updated. Better yet, make certain you are an OSPA member and then join the Government Affairs or other Committee. There is always room for additional OSPA members who want to get involved in bettering their future and that of their patients. Who is to thank? The OSPA Governmental Affairs Committee, the legislative process, the OSPA Political Action Committee and those who support the OSPA by being a member! Please share this success story with your Supervising Physician and Practice Administrator – no doubt they will cheer and support our successes! SB 1548 - PA/NP Technical Fix - A monumental piece of legislation which benefits Oregon’s Physician Assistants and the patients we serve was signed into law by Governor John Kitzhaber. Known as SB 1548, this piece of legislation involved having the OSPA Governmental Affairs Committee review 180 Oregon Statutes and identify 90 feasible sections of the Statutes where PAs were excluded from providing medical care to patients, of which 75 ended up in the final legislation, resulting in a major legislative fix to laws on the books and provide PAs with the ability to practice medicine and not have to worry about obstacles that were unintentionally preventing them from providing patient care. HB 2902, Reimbursement Parity- Requires insurers to reimburse PAs and NPs at the same rate as physicians for the same services in primary care and mental health until 2017. Establishes a workgroup of stakeholders, including OSPA, to determine the best policy for addressing reimbursement disparity. Financial aid for rural primary care providers: Several bills passed to support providers who practice in rural and underserved areas of Oregon, and OSPA successfully lobbied to include PAs in each program. SB 483, Malpractice Mediation - Establishes a universal process for reporting and resolving adverse health incidents; requires providers and patients to attempt mediation before a lawsuit is filed. Does not include tort reform. SB 604, Universal credentialing database - Requires Oregon Health Authority to set up a universal credentialing database for use by hospitals and health insurers. Includes PAs. HB 5026, Oregon Medical Board Budget - Appropriates operating expenses for the OMB for two years. Includes agreed-upon fee schedule to pay for SB 224 implementation. Supervising physicians will pay a one-time $150 fee upon taking the test to become a supervising physician. Physician assistants will pay a one-time surcharge on their new or renewed license in the next licensing period (2014-2016). Includes a legislatively approved average 9% increase in renewal fees, which translates to a $16 increase for PA renewals. SB 224, Updated Oregon’s PA licensing laws -This major overhaul of the governing statutes for PAs brought together the Oregon Medical Association, the Oregon Medical Board and OSPA to collaborate and compromise to make it easier for PAs to be licensed and hired in the state of Oregon. HB 3642, This bill was brought to the special session by ZoomCare. This would allow a panel of physicians to supervise a PA as long as the PA has a supervising physician. This passed and was signed into law. SB 575, Allowed PAs to sign for a 2-Physician Hold - This bill would allow PAs to be one of the providers in case of emergency hold a patient for psychiatric evaluation. This bill was supported by the Oregon Medical Association and the Oregon Medical Board. Several support groups for mental illness were concerned about PAs being one of the providers. This bill did not move out of committee. OSPA Presented to the Human House Services committee a review of PA law and how PAs function in Oregon versus other states. Discussion was held on how the ability for PAs to provide medical care in Oregon can be improved. SB 531, Amends the Oregon Medical Board (OMB) PA committee make-up to increase the number of PA members to 3 along with 2 physician members. SB 678, Places the term and definition of "agent" in the OMB statute in order to clarify the PAs ability to work with an agent physician. HB 2756, Allows PAs to be "attending physicians" for 60 days from 1st visit or 18 visits total and will allow 30 days of time loss. Must be certified by Department of Consumer and Business Services. SB 641, Allows PAs to sign disability forms for fish and wildlife. SB 676, Mandates that insurance carriers reimburse for physician services provided by a PA in all areas of practice. SB 569, Remove sunset clause to allow physicians to supervise four PAs and allow PAs to have up to 4 supervising physicians. SB 570, Removes the sunset clause to allow PAs to work at additional sites outside of the practice of their supervising physician. Involved with OMA in Tort reform for malpractice. HB 2410, Emergency responder bill-allows PAs and other licensed healthcare practitioners to respond to emergencies.